Dark Goddess Musings: Samhain Book Contest! It’s almost Samhain and magick is in the air! During this time of year I re-bless and add to the altar I have dedicated to the Morrigan. So to celebrate one of the Morrigan’s most sacred nights I thought it would be fun to have an altar contest. 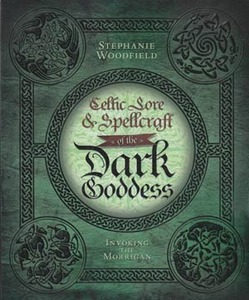 You can enter by going to my facebook page http://www.facebook.com/pages/Celtic-Lore-and-Spellcraft-of-the-Dark-Goddess-Invoking-the-Morrigan/216279705149670?ref=hl#!/pages/Stephanie-Woodfield/262507577096053 and replying to the contest thread with a picture of your altar dedicated to the Great Queen or a Samhain altar dedicated to Her by Nov. 5th. The winner will receive a signed copy of Celtic Lore and Spellcraft of the Dark Goddess: Invoking the Morrigan!